The surgeon creates a small stomach “sleeve” using a stapling device. This sleeve will typically hold 50 ml to 150 ml and is about the size of a banana. The rest of the stomach is removed. 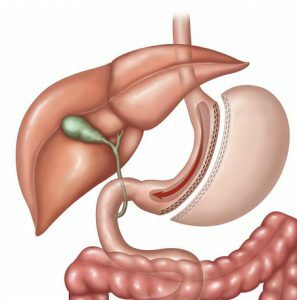 This procedure works in part by restricting the amount of food (and therefore calories) that can be eaten without bypassing the intestines and absorbed. By removing part of the stomach, there is a rapid reduction in the hormone “Ghrelin” which is thought to stimulate appetite. You will feel satisfied quickly.